Adrian Lam's son has a "chance" of making his Sydney Roosters debut against Wigan Warriors in the World Club Challenge. Coach Trent Robinson confirmed the 20-year-old will be in their squad which flies out of Australia this weekend. Lam Jnr, a halfback who has represented Papua New Guinea but has yet to figure in the NRL, was targeted by Wigan for a loan spell for this season. 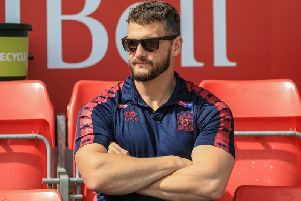 But the Roosters kept hold of him and Robinson confirmed he may figure in the highly-anticipated DW Stadium showdown on Sunday, February 17. "We're just finalising our squad, and I think Lachy will come over," said Robinson during a media conference call last night. "We're bring a squad of 23 but that will include (injured ex-Leeds winger) Ryan Hall, so 22 are available." Asked whether Lam has a chance of playing, Robinson replied: "He's in the 22, so he's a chance of playing." The touring party will not include Kangaroos centre Latrell Mitchell after he opted to turn out for the Indigenous All Stars against New Zealand Maori on February 15 in Melbourne - two days before the WCC in Wigan. "We left the decision up to Latrell, he's a very proud Indiginous man, and his chance to represent his culture was his choice and we'll support that," said Robinson. Robinson added: "We've all spent a lot of time in Manchester and Leeds, a lot of teams go to London, but we wanted to offer that opportunity to Toulouse to train with us as well as do some visits of the war memorials at the Somme to offer them a life experience. "It's not about footy, it's about understanding the way we get to live the way we live, and the sacrifices others made."